I'm finally getting around to some commissions from the backlog. Hope to get a few done before I start the next big project (which will keep me occupied until the end of the year). Nice one Paolo! 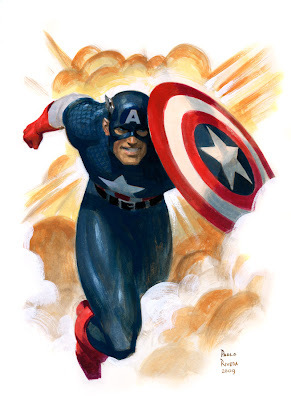 You seem to knock Cap outta the park every time! Can't wait to see future commissions! ¡¡Buf, striking this Captain America. With your permission will be my next wallpaper. So far was your pin-up of an Iron fist. another sweet pin up man !!! Bauxman, feel free to use it as a desktop. Thanks for asking.